This April marks the 400th anniversary of the death of the most revered writer in history, William Shakespeare—April 23, to be exact—and to honor his legacy, his home country of England is rolling out the grandest of celebrations. From historic landmarks in the bard’s birthplace of Stratford-upon-Avon to some of his former haunts in London, the country is commemorating the historic date by unveiling honorary performances, exhibitions, archeological projects, and more, ranging from authentic to avant-garde. Despite the crowds some of these places and events are sure to draw, they’re still worthy of a visit for history buffs, literary types, and, of course, Shakespeare fanatics. So, shouldst thou visiteth England in the near future, here’s how to walketh in the footsteps of the world’s most wondrous scribe. 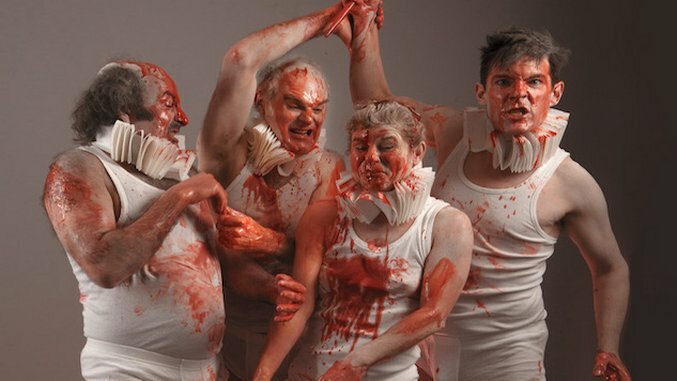 Fans of the macabre, this one’s for you: Experimental theatre company Spymonkey is putting on a 90-minute spectacle that will reenact all 75 of Shakespeare’s deaths—including stabbings, beheadings, two mob dismemberments, and the “black ill-flavor’d” fly from Titus Andronicus. The Complete Deaths (pictured at top) promises plenty of violence and blood, but still will reflect a comedic bent, according to director Tim Crouch. The play will premiere worldwide at the Brighton Festival in May, before touring through the United Kingdom and eventually coming to Chicago in December. Perhaps the most fitting spot to start a Shakespearean sojourn is his actual birthplace and childhood home, a half-timbered house on Henley Street that has been restored and furnished to appear as it did centuries ago. Young Shakespeare was born here in 1564 (by most accounts also on April 23) and lived there until he married Anne Hathaway when he was 18. Costumed docents lead informative and lively tours through the house, while a wall of books at least 29-feet tall stands in the garden showing a timeline of 38 of Shakespeare’s plays. Also on-site is Shakespeare Aloud!, an acting troupe that puts on live performances based on requests from visitors (bonus points for offering something a little more original than the Juliet balcony scene). For the first time in more than 250 years, visitors will have the chance to follow in the footsteps of the famous playwright right over the threshold of his very own adult home: the mansion he purchased after making his fortune on the London stage. It was here that he and Hathaway raised their children, and where he kept his library and likely wrote later plays before his death in 1616. The house was demolished 250 years ago, and an extensive >>$7.5 million renovation project that organizers describe as “the single most significant and enduring Shakespearian project anywhere in the world” will be unveiled in July. One highlight will be a new garden that follows the lines of the former house that was rediscovered in a significant archeological evacuation. The garden will also feature a sculpture of a 15-foot tempest-bent bronze tree, as well as a bronze recreation of a Tudor desk and chair where visitors can sit and soak in the inspired settings, just as Shakespeare did nearly four centuries ago. Shakespeare takes on a whole new flavor when a cast member is extremely drunk—and that’s the basis of this award-winning show by Magnificent Bastards Productions. For every performance, a “genuinely drunken professional actor” is chosen at random, and the remaining cast improvises A Midsummer Night’s Dream , The Merchant of Venice and Much Ado About Nothing around him or her. For more than 30 years, hundreds of runners have gathered annually to pound out the miles in Shakespeare’s former stomping grounds sometime around the anniversary of his death. In this year’s race (April 24), the route will be soundtracked by New York-based artist Devon Glover, aka the Sonnet Man, who performs Shakespearean excerpts in rap form.